Everybody who knows about the new iPhone applications knows about Super Monkey Ball and MLB At Bat. But after dropping all kinds of dough on a new iPhone and a 3G service plan, you can save some cash and get these great free programs ASAP. Note: We tested all of these apps on a first-generation iPhone with the 2.0 software installed, so data uploaded and downloaded at EDGE speeds. You'll also notice that this list is short on location-based apps such as Loopt and Whrrl. That doesn't mean they're bad--it's just that the reviewer values privacy and finds them a little creepy. If you're comfortable with having everyone know where you are at all times, go ahead and try those apps out, too. Here, though,&#160;are my first favorites. Also be sure to see our complete collection of stories, videos, and blogs about the Apple iPhone 3G. One of a few Flickr front-ends for the iPhone, AirMe outdoes Exposure (another free iPhone app for Flickr) by allowing you to upload pics directly from your iPhone to your Flickr account. Results are instantaneous: You snap a pic with your iPhone camera, AirMe geotags it (if you want it to), and it's on your Flickr page within a minute. On the other side of the fence, Exposure lets you browse your Flickr photosets, see photos that have been taken close to your current location (again, if you want it to), and basically presents a iPhone-friendly front end to Flickr. It did crash a few times during testing, however. Finally, a chat app built for the iPhone. The iPhone AIM client worked like a charm right off the bat, but has been crashing a lot ever since. When it works, it gives you access to your AOL Instant Messenger buddy lists, letting you "OMG," "LOL," and "BRB" your commute time away. Is an iPhone-friendly version of Yahoo Messenger--or, better yet, multiprotocol access to all your accounts via Trillian and Meebo--hot on the trail of this mobile IM app? Let's hope so. Stuck in Houston,&#160;but your favorite sports radio station is in Detroit? Want to hear what songs are hot in Hartford when your flight is delayed in Denver? AOL Radio scratches that itch, to the tune of more than 350 radio stations from across America. It's yet another audio-streaming app that works staggeringly well at EDGE speeds; during testing I didn't encounter any streaming interruptions at all. Don't think of it as the "death of radio," think of it as a new distribution platform for radio stations everywhere. MLB's play-by-play scoreboard app that is featured on iTunes costs just $5, but I'd recommend that sports lovers opt for the free SportsTap app instead, since&#160;it gives you instant access to all live sports, not just baseball. 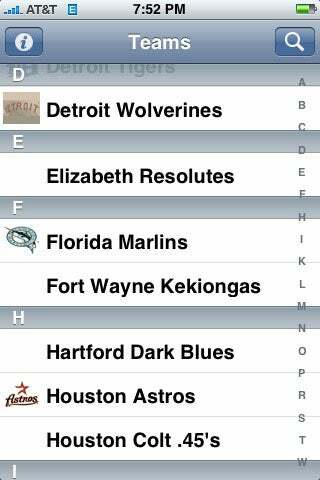 But the Baseball iPhone app&#160;lets you tap into the statistical database of baseball history. Need to know how many doubles Marty Barrett hit in 1986? It's a few taps away. Want to know Urban Shocker's career ERA? That's there, too. It's like having the entire Baseball Encyclopedia right there on your iPhone. We only wish it had team-based stats and year-by-year standings, not just individual stats. 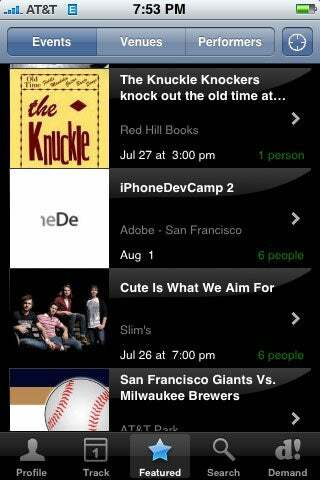 Still, this is a must-have app for any baseball aficionado. Configuring your alerts is a bit of a chore (the Eventful developers may want to consider making the categories "opt-in" by default instead of "opt-out"), but once this app is up and running, Eventful will let you know who's coming to town and what's going on in your neck of the woods. Concerts, book signings, live sports, theater, public speakers, you name it. Need a centralized location for all the notes, photos, and voice recordings created on your iPhone? Evernote lets you save documents and media files on a Web storage platform that you can access anywhere. If you're planning on using your iPhone for taking a lot of notes or snapping a bunch of pictures while you're out and about, this is a must-have app for saving everything to a centralized location that you can reach from any Web-connected device.